Do you know that browsers ignore that you have a VPN and send the DNS request to your ISP directly sometimes. That’s called a DNS leak. Some browsers like Firefox and Chrome support WebRTC technology. WebRTC may reveal your real IP address too! Good news - Trust.Zone VPN protects users against DNS Leaks and WebRTC Leaks. Kill Switch blocks all outgoing and incoming traffic if internet connection drops for any reason. So, your real IP address will never be revealed This feature is extremely important for BitTorrent users and torrents’ fans because BitTorrent users don’t want their identity and IP address exposed to ISP or government agencies. Sometimes browsers ignore that you have a VPN set up and send the DNS request to your ISP directly. That’s called a DNS leak. With Trust.Zone VPN you’ ll never see DNS Leak! Start Trust.Zone VPN > Connect to a selected server > Open dnsleaktest.com website and click TEST to see the results. If you real IP address or real location is not shown - you have no leaks. Some browsers like Firefox and Chrome have implemented WebRTC. WebRTC allows requests to be made to STUN (Session Traversal Utilities for NAT) servers that return the local and public IP addresses for the user. Trust.Zone VPN protects users against WebRTC leaks and keeps users’ online identity hidden. You can easily check Trust.Zone WebRTC protection with the following online tool. 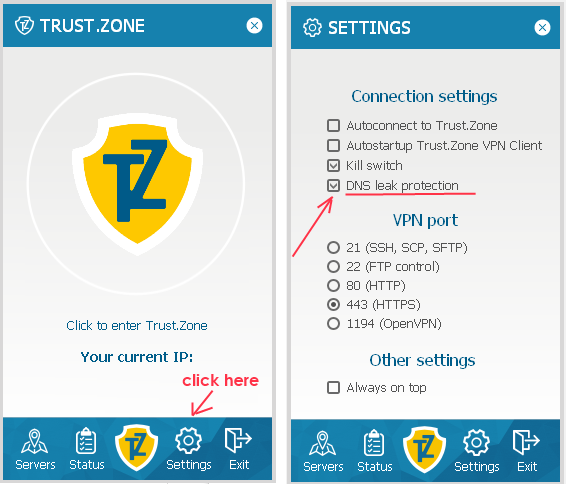 Start Trust.Zone VPN > Connect to a selected server > Go to www.browserleaks.com/webrtc online tool and see the results. Protect yourself while browsing the web right now - use Trust.Zone VPN! With 3 days usage for free, you have plenty of time to try Trust.Zone VPN without any risk.